I’ve tried three different versions of homemade toothpaste recipes, so, I’ll give you the run down of each one. Many, if not all, of these I’ve found on Pinterest. It’s been my inspiration to stop using commercial brands. From what I’ve read from various blogs, there’s this thing called reenamelize. I had no idea that your teeth could do that. I read somewhere that the person had cavities, started using a homemade toothpaste, and 6 months later, no more cavities. I had to try it. There’s several versions of toothpaste and powders here, too. My first attempt was on March 24th using Crunchy Catholic Mama‘s version. 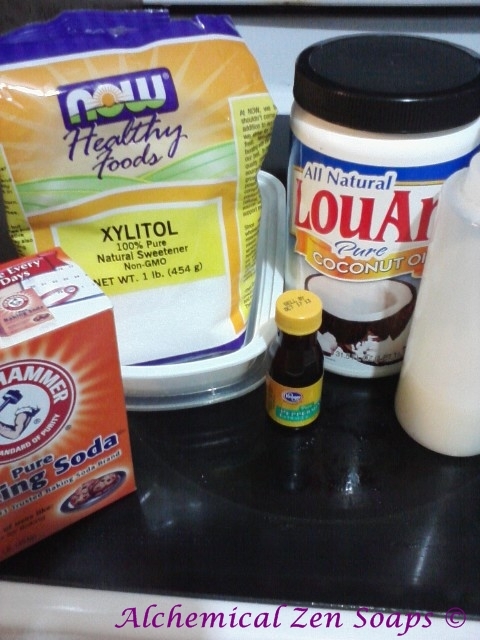 I used the xylitol because it has dental health benefits, such as caries prevention, helps in the remineralization of the teeth and reduces plaque. Tricia recommends putting the xylotol through the blender, but I didn’t. I just mixed it up really well and let it set. Over time it broke down and is no longer gritty. I used her recipe to the T, or at least tried to. The amounts she calls for makes very little to start with, so I made a double batch immediately after to fill the bottle. This is also the batch that lasted the longest, and still have half a bottle left. What I like: First, my initial thoughts. I LOVE how my teeth feel. I run my tongue across my teeth and they feel soooo clean. And it feels that way all day, after breakfast, lunch.. even after dinner. I don’t feel the normal plaque build up that I normally felt with the Arm&Hammer toothpaste I was using (and it was worse with all the other sickly sweet toothpastes I’ve tried). What I don’t like: 1. It makes me gag. I don’t like the aftertaste. 2. Depending on the temperature of my house, depends on how easy/hard it comes out of the bottle. In March, when my house was still below 76° it was a hard lump at the bottom of the bottle, in which case, I need to run the hot water and let it sit for five minutes. Since this summer has been so hot, my house never saw below 80°, in which case, I had to shake it up, pour excess on the toothbrush and bring it to my mouth really quick before all of it dribbled into the sink. I also have to be careful of dribbles on clothing. Other bloggers have mentioned using a sandwich bag with zipper clasp and cutting one of the corners so it can be squeezed out. Another option is putting it in a jar and dipping your toothbrush in it. I’m not sure I’m keen on the double dipping, though. Ew. M~ used it once and wont touch it. He said it was too gritty and he didn’t like the taste. I added 1/4 cup castille to what I have left of the toothpaste mixture. It makes it bubbly and foamy. (Not to be mistaken for Foamy.) I also added a bit more peppermint. Still does nothing for the aftertaste. I’ve been without Medical/Dental insurance since 2008. I have at least 2 cavities I have been unable to do anything about. The first is on one of my front bottom incisors (which had been covered over with a dental enamel, but it fell off), and there is a chip on one of my upper left molars. There was tenderness of the gums initially, but that has gone away. Both cavities are still present. Water – I’m not sure how much water I mixed in. I kept adding until it was a paste. 25 drops of essential oils – I used peppermint, tea tree, clove and rosehip seed oil essential oils. Once it had a scent that I wanted, I mixed it into the clay until it was mixed. I let it sit for a few hours before I used it. I made a small batch because I wasn’t sure how it would turn out. Also, this needs some sort of small spoon if you don’t like the dipping-your-toothbrush-into-the-mix method, or even double dipping if others are using it. What I like: I like the taste. I like the aftertaste, it leaves my mouth feeling minty and fresh. What I don’t like: The clay feels weird in my mouth. I’m not used to it because its more slick than traditional toothpaste. The more I used it, the slimier it felt in my mouth. I ended up tossing this after a couple uses. M~ took one look at it and snubbed his nose. *sigh* He wants white toothpaste, this is more slate grey. I used Wellness Mama‘s recipe, even the diatomaceous earth. Optional ingredients: Essential oils for flavor. What I like: This one has a firm texture. I use a cotton swab and dab it on my toothbrush. It makes my teeth feel really clean. I like the taste and my breath is minty. What I don’t like: I didn’t make enough. Ha! I need to make more of this one, but have been lacking the time. It even got M~s’ approval. Baking soda has tons of uses. For toothpaste, its a neutralizer, mild abrasive and helps freshen breath. 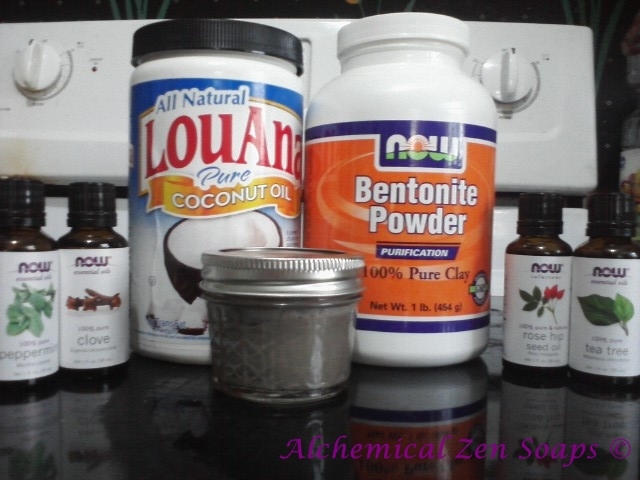 Bentonite Powder Clay – This one is good for removing heavy metals, toxins and other impurities. It also neutralizes acid and removes bacteria. The Calcium Carbonate is used for a lot of things, from concrete to toothpaste. It’s a mild abrasive, a thickening agent and a filler. It neutralizes acid, which is why its part of the main ingredient in Tums and the like. It’s also used as a preservative. I was a little offended when I went to buy the diatomaceous earth because it was listed and selling as a flea killer. Fleas?! Yes, the silica is like tiny daggers to bugs with an exoskeleton, killing them within hours. It’s used in grain silos to keep the bugs off the grain. For toothpaste use, its a mild abrasive and has anti-fungal properties. My big bottle, however, wont go to waste. Other than using it in my garden and toothpaste, it’s also really beneficial to humans for digestion and absorbing nutrients in the digestive track. Check the second link. Bugs loss, our gain. Castile soap, generally made from potassium hydroxide and olive oil, this is another all purpose cleaner, like baking soda. It gives the suds to the toothpaste. Coconut oil has tons of uses, too. It’s antimicrobial, antioxidant, antifungal, antibacterial, etc. It has a shelf life of 2 years. It also makes my teeth feel so nice after brushing. 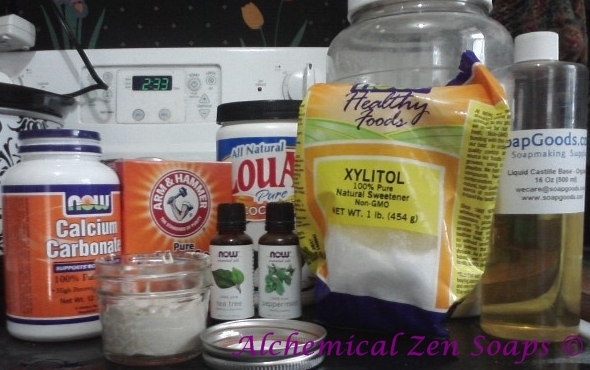 Xylitol is a tooth friendly sweetener, but also helps prevent cavities and helps in the remineralization. Peppermint Oil. Peppermint oil is anti-septic, antibacterial, etc and reduces buildup on the teeth. Tea Tree oil is anti-septic and antifungal, but isn’t recommended internally, I only added the 1 drop. Clove oil is antifungal and antimicrobial. Rosehip seed oil is a natural astringent, antibacterial, and antiviral. Also, a natural anti-inflammatory for gums. This entry was posted in Toothpaste and tagged basking soda, bentonite, calcium carbonate, castile soap, coconut oil, diatomaceous earth, essential oils, toothpaste, xylitol. Bookmark the permalink.